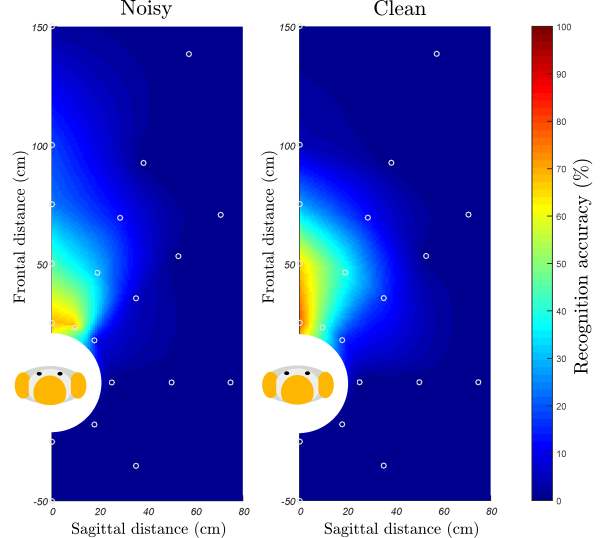 I develop and maintain several scientific software related to robotics. They are all open-source, usually under a permissive license (often BSD). The projects listed on this page the one I consider the more useful to a community. Check my GitHub page for the complete list of my other software projects. We created the project in 2007 with Arnaud Degroote, and since then, 40 people from more than 15 institution worldwide have contributed. 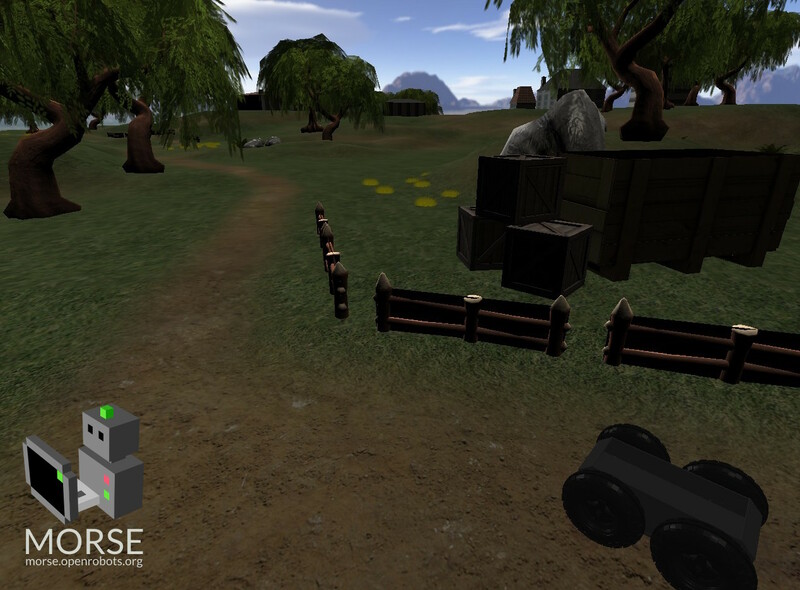 With Gazebo, it is today one of the major open-source robotic simulators. 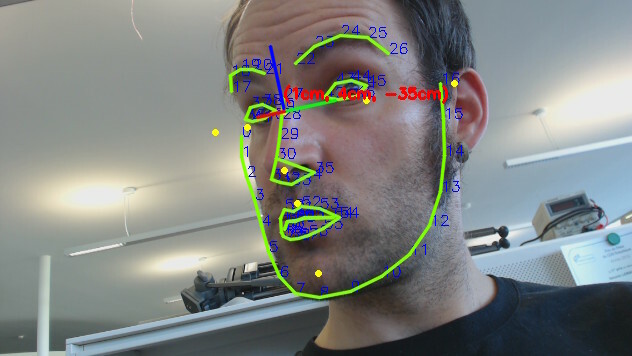 gazr is a library and a set of tool for real-time gaze estimation from simple monocular cameras like regular webcams. It performs 6D head pose estimation and pupil tracking. From Real-Time Attention Assessment to "With-me-ness"
dialogs is a simple natural language processor designed for robots to dialog with humans. 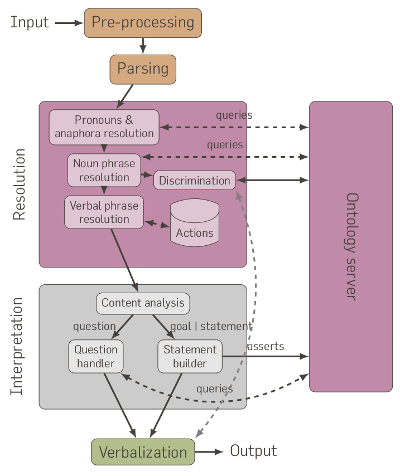 It parses English, tries to make sense of the sentences using a semantic backend (an RDF knowledge base), and answers both in plain English and with RDF statements. ORO, and its lightweight successor minimalKB, are RDF-based knowledge bases: they behave like (SQL) databases, but manipulate instead semantic RDF statements. They also support a range of advanced queries useful to implement high-level cognitive functions in robots. In particular, ORO and minimalKB have been used to implement Theory-of-Mind like behaviours. 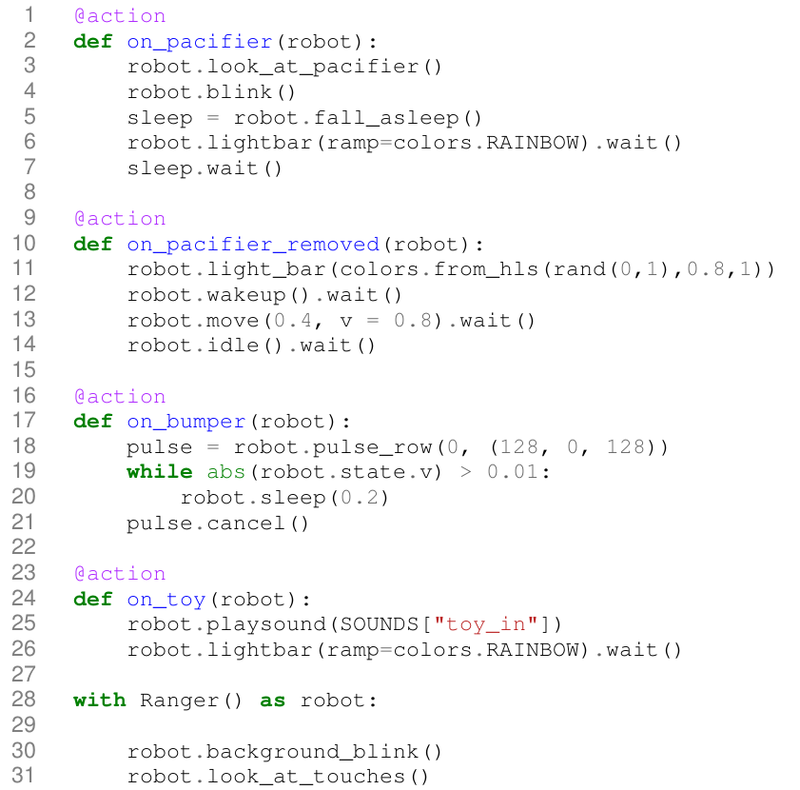 pyRobots is a toolkit for the high-level programming of interactive robots in Python. It provides a set of Python decorators to easily turn standard functions into background tasks which can be cancelled at anytime and to make your controller aware of the hardware resource (for instance, to ensure two tasks are not controlling the same motor at the same time). It also provides a event-based mechanism to monitor specific conditions and asynchronously trigger actions. It finally provides a library of convenient tools to manage poses in a uniform way (quaternions, Euler angles and 4D matrices, I look at you) and to interface with existing middlewares (ROS, naoqi, aseba...). 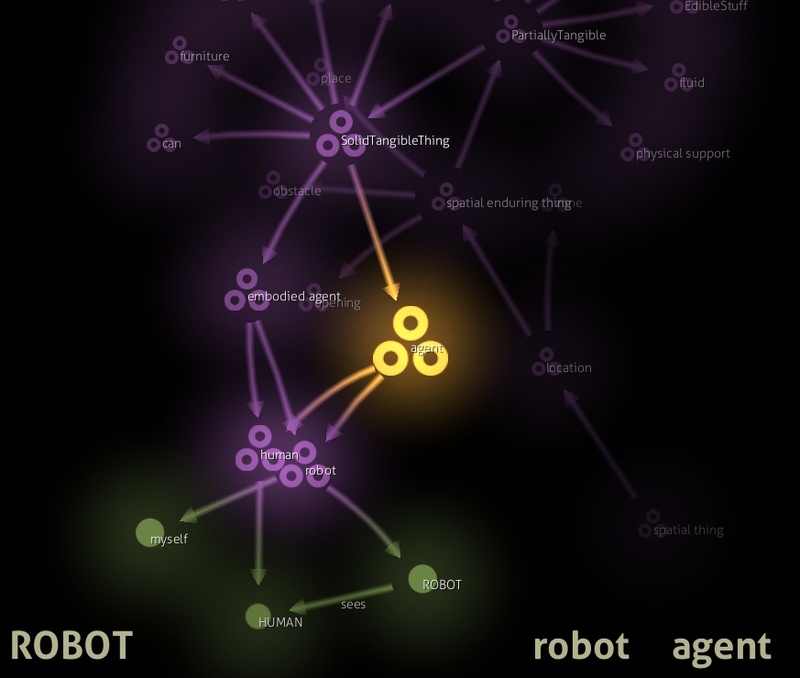 The PInSoRo dataset (also known as the Freeplay-sanbox dataset) is a large, open-data dataset of child-child and child-robot interactions. 120 children were recorded while freely playing with a peer or with a robot, for a total of 45+ hours of RGB-D, audio and interaction data. Besides, the recordings are annotated with 115000+ social behaviours including constructs like solitary vs cooperative play, prosocial vs adversarial behaviours, etc. This dataset comprises of audio recordings of 11 native English-speaking children. The dataset contains a variety of sentences (along with the transcriptions), including 200+ free speech utterances. Recordings were performed in real-world situation (in schools), using different type of microphones as well.